Celebrating its 60th anniversary, Disney has released the timeless classic animated film “Peter Pan” onto Blu-ray for the first time with an impressive trip to Neverland given “Diamond Edition” treatment. “Peter Pan” is one of Disney’s crowning achievements in animation, originally slated to follow “Snow White and the Seven Dwarfs” many years prior, but ultimately held back until technology caught up to Walt’s vision. Ultimately, the characters of Tinker Bell, Captain Hook, and Peter have become synonymous with staying in touch with the kid inside all of us – the little part that never wants to grow up. It’s that part that lets us still enjoy the wonderful artwork of Disney today, no matter how old we are. Like Peter Pan himself, the movie does not seem to have aged at all, presented with a stunning digital restoration, presented in near perfect high-definition with little to no visual noise. Colors pop and lines are crisp in a beautiful transfer. Sound is clear down to every tiny tink. And it’s all offered in the film’s original aspect ratio, a bit thinner than today’s 16×9 standards but entirely appropriate for preserving its history. The film itself can be enhanced by a few Blu-ray extras, the best of which is “Disney Intermission,” adding pirate-infused entertainment when the viewer pauses the movie. Games, animated sequences, and songs vary throughout the film, worth stopping to enjoy on their own. “Disney View” is also available for those who don’t like black bars on the left and right sides of the screen, adding custom artwork that matches each scene – but it can be quite distracting. Two deleted songs included on the Blu-ray are also quite entertaining, accompanied by storyboards to help them along. “Never Smile at a Crocodile” is a classic despite its lyrics not being featured in the film and this release does it justice with a music video of sorts emphasizing each and every word, of which there are many. Other bonus features include a pair of deleted scenes, an introduction to the film by Walt’s daughter Diane Disney Miller (clip below) at the Walt Disney Family Museum in San Francisco, and plenty of classic features inherited from previous DVD releases. There’s no doubt every Disney fan will want to own this release, not only for the best version of “Peter Pan” ever made available to own, but also for the outstanding documentary “Growing Up With Nine Old Men” sharing wonderful insight into the lives of the talented group who brought so many cherished characters to life. 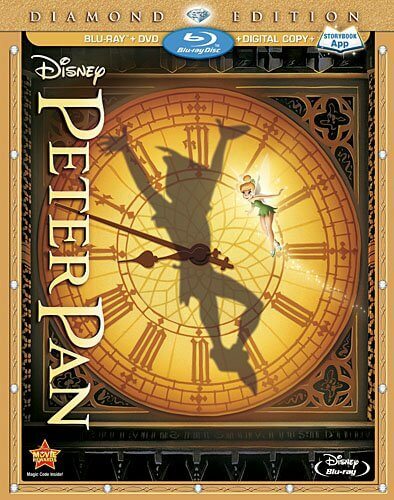 “Peter Pan” Diamond Edition Blu-ray is available now on Amazon and at other major retailers. I like Peter Pan because it has the sneaky crocodile. I call him “Croco-Smile” because he was always smiling and being devious. He is so silly and I wish that he and the alligator from Princess and the Frogs were friends in real life. What’s even ON the Digital Copy disk, anymore? Does it even have anything, except for a code-embedded program to get the iTunes or Windows file? (Which they could just as well do with a piece of paper? It used to be the extra $5 surcharge to unlock the Disney Movies Online file, but, um…they don’t have that anymore. Oh man, I need to get my hands on this. Just hearing “You can fly” makes me six years old again. Just bought the 2-disc edition today. The documentary “Growing Up With Nine Old Men” by itself is worth the purchase price. For the Disney fan, what a wonderful glimpse into the lives of these incredibly talented men. Thank you, Ted Thomas! Please do more! I’m still hoping they’ll put “The Walt Disney Christmas Show” (1951) out as a bonus someday, which promoted Peter Pan on TV. I guess they didn’t include it in the Diamond Edition DVD, since I’ve heard no mention of it. After all, the “One Hour in Wonderland” (1950) TV special was put on the Alice in Wonderland DVD years ago. here aand vist more often. Did you hire out a developer to create your theme?